Extra Atmospheric CO2 Increased Red Spruce Forest Growth 106% Since 1989 | Watts Up With That? Red Spruce Picea Rubens Robert H. Mohlenbrock @ USDA-NRCS PLANTS Database / USDA NRCS. 1995. In commenting on their findings, Mathias and Thomas say that “isolating the effects of increasing CO2 on tree growth in forest ecosystems has been difficult to confirm [in the field] due to the small annual step changes in CO2 and the myriad of interacting environmental factors known to affect whole-tree growth over multi-decadal time spans.” However, they add that “this study not only provides evidence for increasing CO2 having a positive effect on tree growth but also indicates a broad range of complexity as red spruce forest ecosystems recover from decades of acidic air pollution and the realization that none of the environmental factors that are examined here act in isolation.” Yet, as more and more time goes by, and as the aerial fertilization effect of Earth’s rising atmospheric CO2 concentration increases in magnitude, it will likely become easier to recognize the growth benefits of this important trace gas. Figure 1. 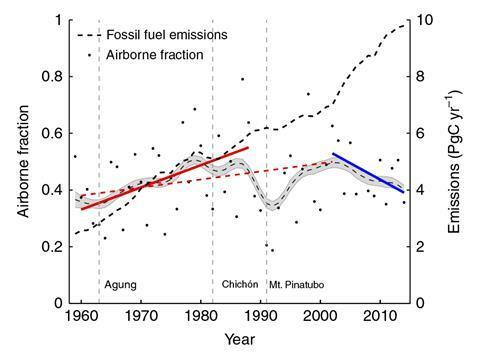 Panel a: Contribution of atmospheric CO2, NOx emissions, SO2 emissions, and mean April temperatures (April Tmean) to the change in red spruce basal area increment (BAI) each year predicted by the GLMM average model for 1989-2014. Panel b: the contribution of CO2, NOx emissions, SO2 emissions, and April Tmean to the total change in BAI over 1989-2014. Numbers in parentheses indicate the direction and magnitude of changes in environmental parameters. Numbers in brackets in Panel (a) represent the trend in each respective environmental parameter over 1989-2014, while numbers in brackets in Panel (b) represent the total change in each respective environmental parameter over 1989-2014. Units for CO2 and April Tmean are ppm and °C, respectively, while units for NOx and SO2are 106 metric tons. Unknown contributions in Panel (a) were calculated as the difference between the observed change and all known contributions. Asterisks (*) indicate significance values (P < 0.05). Source: Mathias and Thomas (2018). December 27, 2018 in Positive effects of CO2. 106% of half, especially since it’s only 105.8% of 50% means that growth is back to normal within a simple margin of error. I’m not an orc so Treebeard is my friend. Once again, we have factors which Mann et al didn’t consider in their indecent haste to ascribe tree ring changes to temperature. In Panel A, above, we see that temperature is the least strong influence, smaller than even the unknown influences. Michael Mann could easily have adjusted his math to compensate for any reality which he might have been faced with. This is the advantage of starting your equation with the result! When exactly, during the last 4.5 billion years, was the climate NOT changing ? April 1st, 1,000,365 B.P. at 4:00 P.M. Mountain Central Time for about 2 minutes. Its pretty dumb to attribute something like beetles, to something that isn’t happening. !! Beetles are very good in doing nothing much to worry about. Extremist greens make some faux noise here, because beetles are only an economical issue for forest owners. Loonygreens themselves just want the biodiversity the dead trees create, so them complaining on that is — well doesn’t appear too honest. But griff is also a bit right. Conifers don’t grow well on the southern border of the boreal zone, because dry and warm spells will more probably than not eventually kill the trees as beetles sometimes make an epidemic. Such is evolution / competition in the nature. The western pine beetle is indeed a real threat, particularly to stressed trees. Drought certainly stresses trees, but drought is nothing new, it is all part of the natural variation in climatic conditions that every spot on the planet has always experienced ever since earth acquired an atmosphere and surface water. The climate alarmists claim that the drought is caused by “warming” but droughts are mainly caused by shifts in wind patterns and in ocean surface temperatures like El Nino and La Nina – not by general warming which has been minimal. I’m in Zone 7. Conifers grow just fine here south of the boreal zone. Conifers are what the Southern states are harvesting and shipping to Great Britain and Europe for combustion in their “green” scam generators. That would be zones 8 and 9. A good mature (i.e. non-producing, little carbon-sinking) forest has some 50,000 full grown logs pointing upwards per each square km (km2 = less than half a sq mile), so ‘tens of thousands of trees’ in the USA is in the margin of the margin. Extreme left greens who smoke or just like forest fires are a much bigger risk. That’s one of those easy obvious relationships that’s probably wrong. It looks like beetle infestation and forest fires are a spurious correlation. They are both caused by the same thing, heat and drought.
. . . and forest age. Trees age and die. Forests of trees sprout, grow, and die. Neither snow nor rain nor heat nor gloom of night will keep them alive forever. Isn’t it amazing. If something bad is happening, just claim CO2 is whut don it and stop thinking. In years past I was associated with chemical plants that emitted occasional levels out-of-compliance SO3 and separately, SO2 gases. Boy, did the conifers not like it. Flying into a valley in PA that had a bad source of SO2, I noted that downwind hillsides were full of dead pines. A fertilize plant elsewhere reportedly bought 1,400 acres of pines after its Sulfuric Acid plants emitted SO3. I always wondered if the SO2 was worse than the SO3 in its effect. On the other side, 70& of the world’s agricultural lands are sulfur-deficient. After acid scrubbers were installed on fossil fuel power plants, farmers had to but higher sulfate fertilizers to grow tomatoes. Trump would do a world of good if he would overturn the ban on phospho-gypsum from phosphoric acid plants. World-wide, it is used as an agricultural sulfate source. Although containing very low levels of radioactive materials, the UN radiation buffs say it’s not an issue. They have been doing this for a long time, more common now in part because of fire suppression of past decades, Fires would have greatly smashed down the infestations by removing infected trees. Poor forest management and the lack of forest fires has been the largest contributing factors for the increased number of beetles. Smaller fires, more often tend to burn close to the ground where the beetles are found. Without the fires burning, the beetle population exploded, causing more dead trees. Blaming climate change for the beetle population growth, is a red herring. Particularly when it comes to the pine beetle. It has the ability to change the water in it’s body into ethanol. When winter comes around, the temperatures where I liver have never been cold enough (40 C or F) for a long enough period of time (> 2 weeks) to freeze the beetles to death. Bark beetles are a direct result of “doghair” forest growth AKA “total fire suppression” for the past 100 years! Natural fires thin forest floors, eliminating the scrawny undergrown trees which never receive enough sun light. Bark beetles are lazy little buggers and don’t want to travel very far to the next tree. Allowing fires to burn naturally, greatly slows or even stops spread of the beetles. Burning, yet again, is the BEST forest management! Nature knows what she is doing! 0.8 degrees of temperature increase over those 100 years has NOTHING to do with the bark beetle problem! Would the Lotka Volterra model fit what’s going on, with CO2 the rabbit and tree growth the fox? The cycles would be measured in centuries and there would be signs of human disruption, but essentially the process would be completely natural. Right, so more than one factor. What happened to the other factors they list? Why is the headline attributing it all to CO2? “”They trigger changes to the balance of animals in an ecosystem as if they were top predators,” she said. Our gracious host doesn’t change headlines, or stories. Rather, he passes along what he finds. Chastising him for the mistakes of others is poorly placed criticism. Chastising him for not reading your mind or passing along only the articles you find fit, is a poor use of your time. I don’t think Dr. Craig Idso wrote the headline that has been attached to his article. Well you’d be wrong, it’s the title he used when he published the article in his own blog, CO2Science. I don’t see it there. What am I missing? Perhaps a moderator can provide some clarity as to who did write the obviously factually incorrect headline? But they don’t say the same thing. The headline here attributes the 106% growth to CO2, but Idso only says it is the largest factor, and other factors are listed. That is plainly and simply not saying the same thing. I fail to see what is complicated about this. Anyway, I have no choice but to drop it now as ordered. But you heard it here first. CO2 being the largest factor is equatable with CO2 itself being responsible for 106% increase in growth. In fact, looking at the graph provided by Isdo, it appears that changes in SO2 levels account for more than 50% of the change value attributed to CO2. Hardly an unimportant small value not worth including. Philip, the problem YOU have is that the headline: Extra Atmospheric CO2 Increased Red Spruce Forest Growth 106% Since 1989, was NOT a headline of a science paper. It was to highlight something important from a published science paper, which you seem to have forgotten to read itself that supports this from the posted Dr. Isdo article. Gee it mentions all the OTHER important factors as well, you claimed was being left out. Sometimes it is better for you to not get carried away over something that wasn’t impairing anyone’s learning at all. It was all there in front of you….. the whole time. Correct, and as it should be, because the paper says no such thing. The paper doesn’t say that extra atmospheric CO2 increased red spruce forest growth 106% Since 1989. It says that CO2 is the largest of many factors. You don’t get to 106% (well, 106% isn’t accurate either. 105.8% is the stated figure) just from CO2. Claiming that 106% growth was caused by CO2 is not highlighting something important from a published science paper, because the paper says no such thing. The paper does not say that “Extra Atmospheric CO2 Increased Red Spruce Forest Growth 106% Since 1989”. That the article explains that the claim that CO2 increase red spruce forest growth of 106% since 1989 isn’t correct doesn’t make the headline factual and accurate. So I read the article. Nope, that claim isn’t made. You don’t get to 106% with CO2. So I google searched the article. The only reference to the headline I could find referenced WUWT as the source. So I read the paper. Nope. Neither the headline or the claim are present. According to my back of an envelope calculations, CO2 accounts for 60% of the increase in basal area. SO2 accounts for 40%. So of that 106%, approx 64% can be attributed to CO2. CO2 being the “number one” factor does not make the headline accurate. I mean, it’s not like you can say that CO2 accounted for 98% of the 106% increase, so close enough. It’s only 64% of the 106%. Wow, rather impenetrable statistics here. Certainly quite a lot of painstaking field and lab work. To an outsider looking at this arcane field it seems to make quite a lot of sense, but there are one or two things that puzzle me. The data before 1940 is discarded, following a statistical identification of an inflection point the authors label as “the end of juvenile stage tree growth following logging in the early part of the century”. This inflection point is common to all samples from all three sites. Historical confirmation of this would be good, as well as actual dates, and also the nature of the logging – clear felling, species specific, or thinning. This is important because the association of the later change points in the proxy values to SO2, NOx, and temperature assumes sample trees of mixed age. Otherwise, might we not just be looking at the growth profile of a forest? They have already dumped the “juvenile growth” period, and by similar logic it might be wise to dump the later periods…? I don’t see this discrepancy in the treatment adequately justified. Dr. Idso might put me right here, of course. Also note that the link with temperature is extremely tenuous, and only to April avg.temperatures. The significance is not found for any other month or measure of temperature. Don’t forget certain bristlecone pines, important to the Hockey stick. One question was always, did the thinning of the forest cover (less crowding) have more to do with growth rings than temperature and moisture? What about micro-climates? Mann’s Sixty odd trees cut down to find one with the correct ring configuration suggests me that the tree in question could have lived in a micro-climate different from the rest… Perhaps an Arborist could illucidate? Historical confirmation of this would be good, as well as actual dates, and also the nature of the logging – clear felling, species specific, or thinning. This is important because the association of the later change points in the proxy values to SO2, NOx, and temperature assumes sample trees of mixed age. Otherwise, might we not just be looking at the growth profile of a forest? The logging industry descending on this area in the 1880s associated with the railroads and basically cleaned it out by the 1920s, it was clearcut and burned. So you are looking at the growth profile of a forest and the influence of the various parameters on it. The age distribution of the forest was 109 ± 27 years. NOx being detrimental to plant growth puzzles. When I was at school 50+years ago I was taught that plants required Nitrogen which had to be fixed from the atmosphere. Some plants did this, legumes and clovers, but one source were NOx compounds created by lightening. Are fossil fuel NOx and lightening NOx different? So you are correct NOx is good for plants and the decline has been bad for the trees. Technically not a double negative, since the two words “reductions” and “negatively” apply to different things. The sentence is just saying that both things went down at the same time. Conifers don’t like to bath in acid. Their biology is not much requiring a large quantity of nitrogen, they will use nitrogen fixed by previous alders though. Conifers are very dependent on mushrooms doing hard work at the forest bottom to collect stuff, I guess mushrooms provide them with N, and get sugars back in exchange. Sometimes mushrooms connect a stump of a tree to a living tree, keeping the stump alive without green bits. So I’ve heard. The forest bottom under spruces may be void of plants, since spruce collects both light and nutrients, leaving the bottom nothing worth growing anything. I think you’re thinking of mycorrhizae, not “mushrooms.” Many mycorrhizae don’t produce what we think of as mushrooms. ?Are fossil fuel NOx and lightening NOx different? Zeus’s thunderbolts (60-100 per second world wide) are accompanied by rain which disolves the NOx to make good acid rain to make nitrates for plants that lack the talent of legumes to help themselves from the atmosphere. The FF NOxes come from Auto exhaust pipes in places like Los Angeles where it doesn’t rain, and instead of feeding plants it is inhaled by Los Angelenes making them sneeze and cough like hounds in a pepper mill..which is probably why they vote for people like Maxine Waters…. thinking perhaps that she can make rain/Waters.. but that connection needs further study. Very interesting study. Illustrates once more how complex the tangled system is. Will this bring down the cost of Christmas trees? Since the margin of error on tree proxies of any kind is about 18% and a 105.8% increase over a 50% decrease is literally 102.9% of “normal” I’d say that not even Mann could pull this claim off. They are not just comparing BAI for 1940 with that for 2014, which would be a change of less that the uncertainty. They compared 1940 with 1989 and found a change much larger than uncertainty then they compared 1989 with 2014 and found a change much larger than uncertainty. CO2 is the lightning rod for anything climate. False claims like that weaken our case. What happened to the other factors causing climate change? Why do “Climate Scientists” attribute all warming to CO2? Because they are not scientists. Because the author of the piece is a well-known climate sceptic and it fits his political agenda. So according to Idso, CO2 4.38cm, SO2 2.96cm. But I’m not allowed to talk about that because apparently it is obvious that the headline and study are consistent and the headline isn’t at all misleading attributing it all to CO2! How depressing it is for alarmists that plants are devouring CO2 emissions. A simplistic and poor attempt to pick a fight with warmists. Nitrogen and sulphur are vital plant nutrients, Sulphur is now ranked as a Macro-Nutrient – right up there with Phosphorus and Potassium. Acid Rain is as big an imaginary hobgoblin as ozone holes and even the GHGE. Since industrial pollution was cleaned up here in the UK, it is now commonplace (read= essential) for farmers to use fertilisers containing sulphur – unheard of 4 & 5 decades ago. In order to get a decent yield of *anything* not just oil-seeds as previously. So what happened to the trees – why are they growing faster? Is the air cleaner – is there less soot, smoke and dust floating around in it? IOW, is the sky cleaner, are the trees getting better light, more light? Have busy airline flight-paths been moved or changed direction? Power stations upwind been decommissioned or simply changed from coal to gas? What about agriculture upwind of the trees? Were those nutrients measured before and after? What about the corpses of all the soil bacteria that are routinely killed by ploughing & cultivators inside ‘annual’ agriculture. They all contain DNA = protein = nitrogen = plant food. No. Everyone is looking up into the sky and what is happening is all beneath our feet. A leaf straight out of conventional climate science- a Preconceived Notion straight out of nursery school went out in search of supporting evidence (while disregarding *any* other possibility) and surprise surprise, found what it wanted. I’ll wager you actually believe in Santa Claus, the Tooth Fairy and that eating fat makes you fat. Plenty evidence out there to support any & all of those theories, let the good times roll. But back then the UK was known as the bronchitis capital of the world, since when the death rate due to respiratory disease has dropped substantially so I would think it’s worth the trade off. How can Trump look at himself in the mirror? Actual report is quite clear that the researchers “… rank the decline in SO2 … topmost … factor contributing to … growth increases … since 1989 … ((& that)).. increase in ◇13C ((carbon isotope)) … function of decreasing pollution … ((while April temperatues)) … warmer … ((accelerating)) … early spring phenology … contributed to tree growth increases ….” As per O.P. cited study’s own section titled “Discussion”. Edit : last sentence inside double parenthesis brackets (( …)) should read as only “((water use efficiency is))”; delete the term eCO2 within. O.P. author , not the actual researchers, chose to highlight “basal area index” increase to eCO2. This seems to have been used to justify O.P. sensationalism about eCO2. Tree ring width, which casual WUWT readers know something about, is measured in mm horizontally & it is not the same as basal area index, which is measured in square mm per area of land the measured trees are growing on. The determination of basal area measurements are taken at about chest height (1.3 meters off the ground) to get a tree’s circumference (including all tree bark) & then divided by pi (3.14) to establish the diameter which is then formulated as an “index” (forestry uses “index” to estimate how tree stand is stocked). Yes, I certainly accept the conclusion of eCO2 impact on trees’ basal area. What the O.P. submitter ( as functionary from the Center for the Study of CO2 & Global Change should know) omitted to elucidate is that eCO2 is commonly associated with changes in plant partitioning of assimilated carbon to lower plant parts. Why the decrease between 50 and 89? The paper seems to blame air pollution. Then how do these sorry excuses for researchers account for the daily and much larger changes in local CO₂ changes? Likely, they do not; it never occurred to them to investigate actual conditions in the forest and to determine specific in situ “myriad of interacting environmental factors known”. While they are at it, they should pay close attention and expend effort to discover all of interacting environmental factors. Such an avalanche of poorly thought out, designed and implemented research projects at the end of this year. Apparently, something else is in the wind as they must be planning another grand amalgam of nonsense for their false consensus. Another poster who can’t be bothered to read even the introduction to the paper, no logging since 1900! Phil’s flimsy falsehoods and fake straw men whiffs again! Logging has zero to do with my comment. Which means you didn’t bother to read my comment. Phil’s flimsies simply dropped a fake comment and accusation. And how does this sorry excuse for a critic justify his remarks without even reading the paper? The abstract is filled with sufficient absurd silliness that reading the full paper is unnecessary. * ‘Picea rubens’ is an altitude dependent tree that grows poorly at lower elevations. * West Virginia Appalachians have sufficient altitude for ‘Picea rubens’ survival only around peaks and the highest ridges. * Only three locations were sampled. * Isn’t amazing that these characters only got 75 years worth of tree rings from locations that have not been logged since 1900? * It is a base assumption that by claiming “not logged”, they mean “not logged” by a clear cutting commercial company. Local harvesting is unverified. * These alleged researchers promoted their own tree ring analysis and then combined it with data collected from other sources. * Then they tortured the data extensively. * Yet these alleged researchers practised omniscience by knowing every possible variable Red Spruce requires for growth. * An omniscience that these researchers then used to reach gross assumptions and conclusions, in spite of an inability to confirm. It is stunning that these researchers found comprehensive excellently collected and maintained “environmental factors” for their miniscule sample area of West Virginia mountains. Leaving flimsy phil grasping at ad hominems and false straw men to justify the findingings of these researchers. Surely this is a prank. There is no way the study would pass peer review. How could they possibly show that trace gases were the primary cause of either growth or shrinkage? Trees are limited by the most limited resource. Did they even look at the logging record, for example? Makes me think back to the observation that CO2 follows temperature …. not the other way around. So, essentially, temp goes up, increases CO2, which in turn increases tree growth. …. not CO2 goes up, increases temp, increases tree growth. I think Mann needs to go back and refigure his tree ring analysis, and include this very pertinent point. I guess the solution to that is to cut down red spruce trees. I wonder are endangered plants dealing with the increase in Co2. I bet there is needed reviewed by some government agency. Oy! As others have pointed out, the title of this post is very misleading. The research presents a complex picture of the interactions of multiple variables. There are a whole lot of statistics used, and it would take time and expertise I don’t have to go through them. One thing I did notice, though, is that they measured photosynthesis and related phenomena at different CO2 levels, without taking into account that as CO2 levels change, there could be a change in stomatal density on newly-produced needles (I don’t know if this is true for red spruce, but they didn’t say otherwise). It was also hard to tell from the methods whether they waited an adequate amount of time for the stomata to adjust to CO2 changes. The fact that there was apparently an abrupt change coincidentally in multiple parameters seems a bit fishy. From what I can tell, they then used before-and-after averages of long periods in some of their analyses…but I don’t have time to give it a thorough reading. Logic and reasoning escape these alledged scientists. If CO2 has been steadily increasing, how could the tree growth dive then rise dramatically, if the ‘main’ growth factor is CO2??? Logically, CO2 must not be the main factor. Maybe it is the only factor they can get funding for, so that is all they see. With the planet having increased forest cover by 15% in 30yrs up to 2014 (a nasa report), not to mention other plants, arid country greening worldwide and bumper crops, the main change has pretty obviously been a 42% increase in CO2 since 1940. Regarding warming, most of it occurred before 1940. The ~40yr cooling to 1980 (alarm over the Ice-Age-Cometh by scientists), occurred while CO2 was rising rapidly. The 20years of ‘warming’ to late 1990s was largely a recovery to 1940’s peak, and then it plateaued for ~18 yrs not much above if any the 1940 level, despite a 42% increase in CO2. Oh yeah, they had to adjust all those temperature ups and downs or accept falsification of the strong CO2 -delta T theory. It is an irony that the only unequivocal significant climate change that has occurred is a paradigm change in plant growth that Global warming proponents don’t like hearing about. NOx and Diesel scandal pollution. Without pictures of cooling towers blocking sun. Climate skeptics/realists should hail and promote “atmospheric CO2” that promotes plant growth — you know, the good kind, just like good cholesterol. The public just might buy it! “aerial fertilization” – nice way to look at it. In a few years the EPA and courts will be able to change the endangerment act and list co2 as aerial fertilization and not a pollutant is what I read from his article. Another nail in the coffin, now so full of nails it is more nail than wood, of C (or D, or whatever you want to use) AGW.